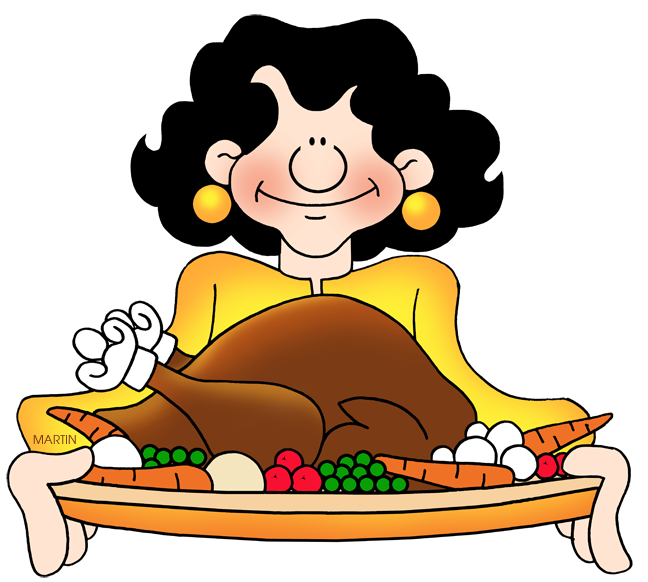 It's Thanksgiving Time again, and while Bobby and I try to teach Emily to be thankful for all we have each day of the year, it is nice to enjoy a special day set aside for that very thing. A day to spend with family we don't get to see every day, a time for a feast, a time for fun. To start off our pre Thanksgiving festivities, Emily and I worked on some Zentangle art. Normally Zentangle art is black and white and is made by using repetitive patterns, but we decided to make a variation of the idea after I saw a Zentangle turkey on Pinterest. On the post I looked at, they had simply copied some blank turkey coloring pages and then started making patterns with colored markers. I think our efforts turned out pretty well, how about you? 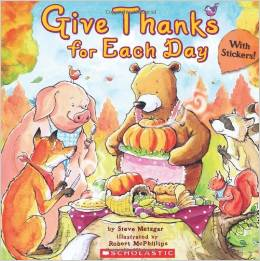 And of course the day also involved a Thanksgiving book, a beautiful book called Give Thanks for Each Day by Steve Metzger. The illustrations by Robert McPhillips were equally delightful and lent an extra special joy to each page. Told in rhyme, this story reminds us to be thankful for the small things, everything from new crayons to parades. It also reminds us to be thankful for each other and the love shared in moments like holding hands. This book would be especially good for children five to eight who are just starting to learn the concept of thankfulness. 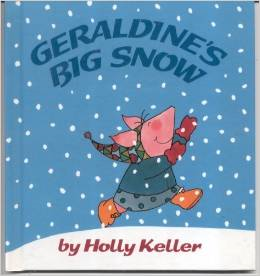 I also read a book called Geraldine's Big Snow which also seemed appropriate give we recently had our first couple of snows of the season here in Ohio. When Emily was very young, we would regularly read another Geraldine book called Geraldine's Blanket. It was one of her favorites and she always requested that I read it with the voice. The voice happened to be my version of a southern accent. Not very good I'm afraid, but a must in Emily's opinion. This book told of Geraldine's wait for the first big snow of the year. She wanted to sled, so she waited, and waited, and waited for the snow to fall. Finally she had to go to bed and while she slept, the miraculous snowflake accumulation finally happened. This book is also a good read for the five to eight range and well worth scouring your public library for since it is an older book an not in print any longer. The Kentucky Book Fair, Unexpected Surprises, And Some Really Great Books! This past Weekend I participated in the Kentucky Book Fair and it was a blast with Bobby and Emily joining me for a mini vacation. We arrived on Thursday and had dinner at the Longhorn Steakhouse where I had a parmesan garlic chicken that was so delicious I almost cried. 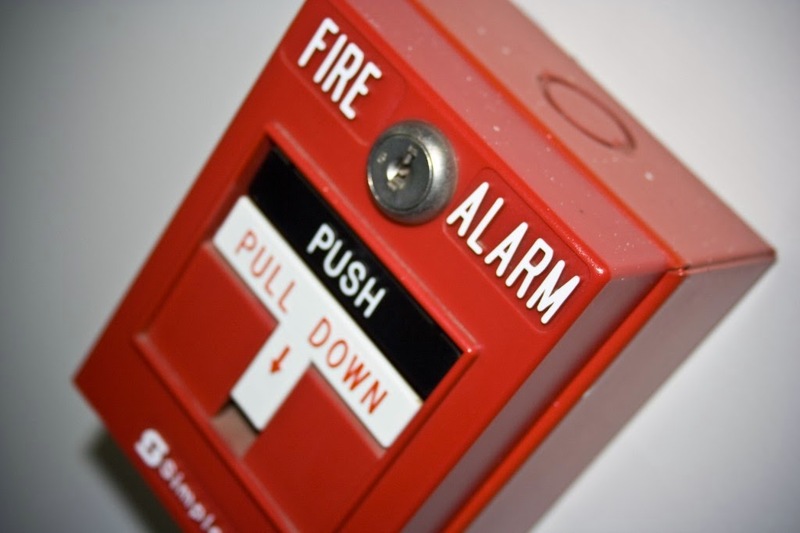 The next morning we went down to the hotel restaurant for breakfast, and just as we were seated, the fire alarm went off. Since we had no jackets and it was bitter cold, they allowed us to congregate in the lobby. It was like old home week as my author friends came down from their rooms. I chatted with the ever entertaining Debbie Dadey as she put on her socks. I chatted with the ultra talented Johnette Downing. 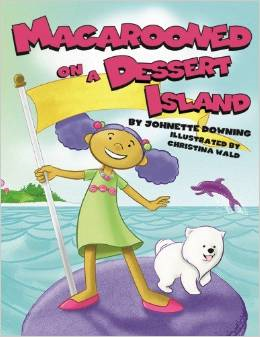 I met Johnette's illustrator the fabulous Christina Wald who designed the cutest pictures for Johnette's latest book, Macrooned on A Dessert Island. And I finally got to meet my longtime facebook friend and author, Laura Eckroat who also had to stop and put her shoes and socks on. While we waited and mingled, Debbie even managed to get a picture of a fireman holding her nephew's Flat Stanley. 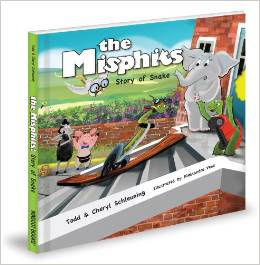 Children's day was lot's of fun, and I even made some new author friends like Todd Shleuning and his wife Cheryl who were there with their book, The Misphits. While I handed out signed bookmarks to all the children who visited, Bobby and Emily went to visit his Aunt who lives two hours away. At the end of the day, Bobby and Emily hung out at the hotel as I attended the author meet and greet with Debbie and Laura. We had a wonderful surprise as we dined on delicious appetizers, and that was the addition to our table of Kevin "Special K" Daley the former Globetrotter and current Motivational Speaker. 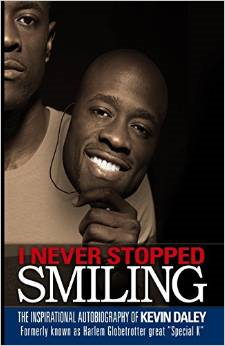 He was down to earth, as friendly as a person can be, and there to sign his autobiography, I Never Stopped Smiling. The next day at the regular book fair, I spent time in-between customers hanging out with one of my favorite illustrators, Mark Wayne Adams, one of my favorite Christian Romance authors, Virginia "Ginny" Smith, and Murder Mystery Man of the hour, Steve Demaree. I even managed to sneak a read of Laura's third book, Went Out To Get a Donut- Came Back With a Muffin, and I have to say that every book I read makes me love her even more. Her talent for writing beautiful picture books is astounding. While I spent my last day at the fair hawking my own books and schmoozing with friends, Bobby and Emily went to the Great American Dollhouse Museum. I'm not sure who enjoyed it more, Bobby or Emily. When they got back, they could hardly wait to tell me of there own adventures. All in all I would have to say it was a great four days. It was a good week. 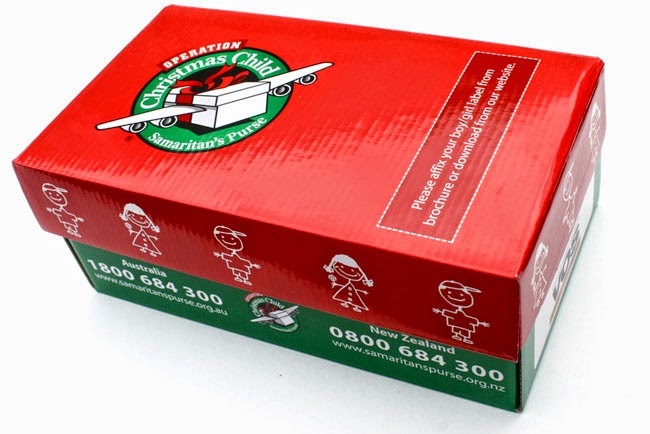 Emily and Bobby went to a father daughter sundae bar held by her American Heritage Girl troop, and they filled a Christmas shoebox for needy children. I had a book signing and reading at the Learning Rocks Expo in Columbus and held a children's writing workshop for kids in kindergarten to sixth grade after my signing and reading was done. The handful of children who attended my workshop worked hard on their stories, about a mouse at a birthday party, using six picture prompts I created. And although they each wrote using the same six pictures, each story was unique and quite interesting. It was so much fun to see each child write their ideas down on the paper and then start to craft them into a story. We discussed what a rough draft was and how it didn't need to be perfect. We discussed how it was good to have another person proof read to help find mistakes. We discussed the importance of reading and writing. One special family, really made my day. The Baumgardner family, who had purchased my first book, Fern Valley, three years ago when I was at a home school convention, heard I was going to be at the expo, they made a special trip to buy book two. Their oldest daughter Katie stayed for the writing workshop and shared with me her desire to one day be an author. Her writing was quite good and I have no doubt that she will one day see her dream come true. A last but not least, I rounded out a wonderful week by reading two fun fall books for this review. 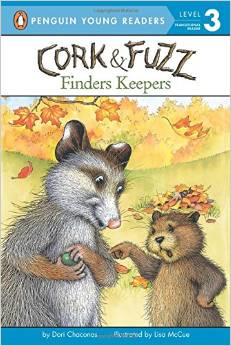 The first was Cork & Fuzz which told a story of two best friends, a muskrat named Cork and a possum named Fuzz. Fuzz believes in the saying finders-keepers, but what he finds and keeps is his friends special green stone. 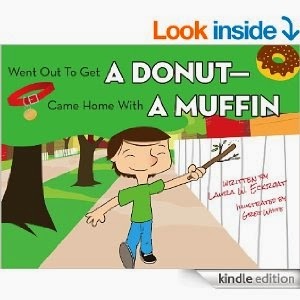 The story tells of the lesson Fuzz learns about keeping something that doesn't belong to him. It is a great lesson story for children six to eight without being preachy. 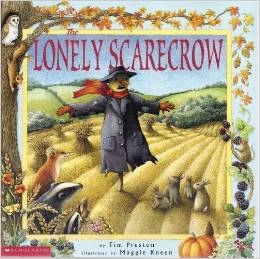 The second book I read was the Lonely Scarecrow. I must say I was surprised and thrilled with the beautifully embossed pages that gave a delicious texture to the fabulous illustrations. The story was quite surprising too. The lonely scarecrow just wants to make friends, but all the animals are frightened of his appearance. How he finally makes friends is lovely and unexpected. It was an extraordinary week. 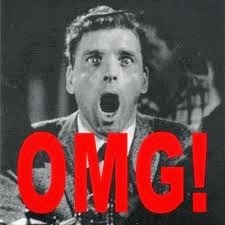 Not because anything extraordinary happened, but because of all the ordinary events that occurred. Events that make up the everyday moments of our lives, or as I like to say, the glue that sticks it all together. Emily had a special practice for her part in the Independent Studies Christmas Pageant coming up in December, and she had a lot of fun at practice. She was able to show her father and I the routine later that evening, and it was such a joy to watch her dance to the music. Emily and I then took this past Friday off to have a girls' day out. Homeschooling affords us the opportunity to do this occasionally, so we took full advantage. We set out to do some Christmas shopping, buy some groceries, and get some pizza. 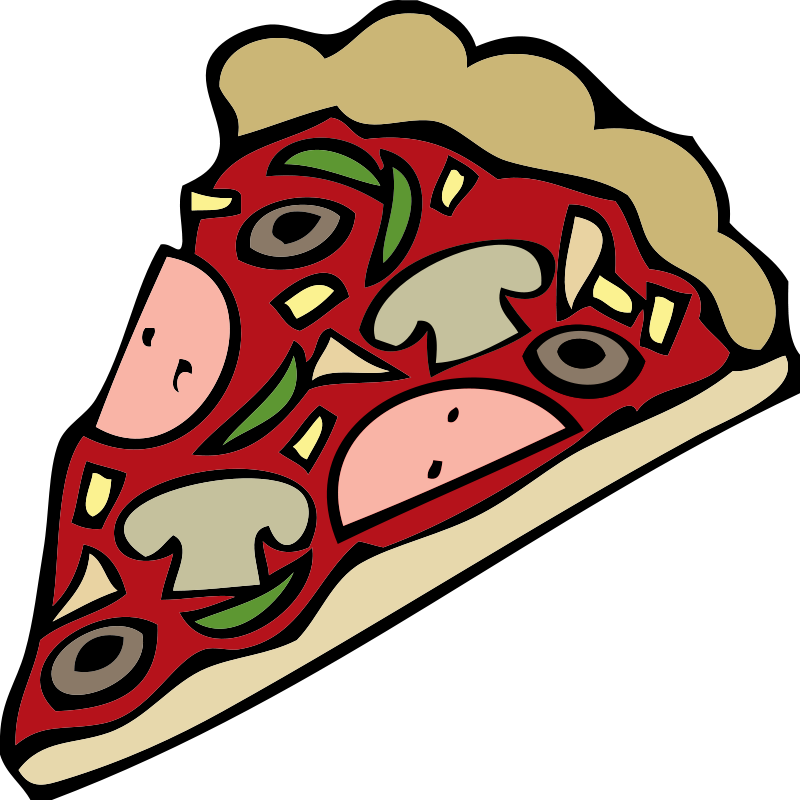 We went to a small pizza parlor in a nearby town for which we had a discount coupon from Emily's summer reading. We shared a large salad while we waited for our pizza to finish cooking, and when it finally arrived, we were pleasantly surprised to find it was the best pizza we had ever eaten. The sauce was sweet, the bread was delicious, and the cheese was the real mozzarella that strings when you pull a piece off of the pizza pan. 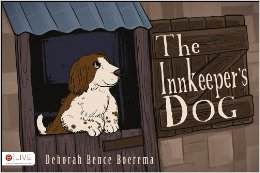 Saturday found me at a book event where I shared a table friend and fellow author, Deb Boerema, who has an exceptional Christmas story called The Innkeeper's Dog. It reminds me of my favorite Christmas carol The Friendly Beasts. Not only did we get to visit, but our sales were pretty good that day as well. And then of course Sunday evening rolled around and it was time to read and review for this post. I can't think of a nicer way to wrap up a week full of normal, wonderful, and ordinary times that make life extraordinarily worth living! Since I hadn't had time to visit the library this past week, I decided to choose a book from Emily's bookshelves. 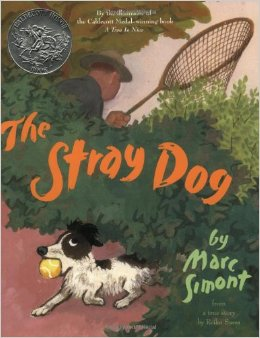 What I chose was another dog book called The Stray Dog. It is an ordinary book with very short and to the point sentences. On some pages, there are only pictures to tell the story. But this ordinary story of how one family finds a dog to love is based on a true story. And in my book that makes it as extraordinary as my week was.